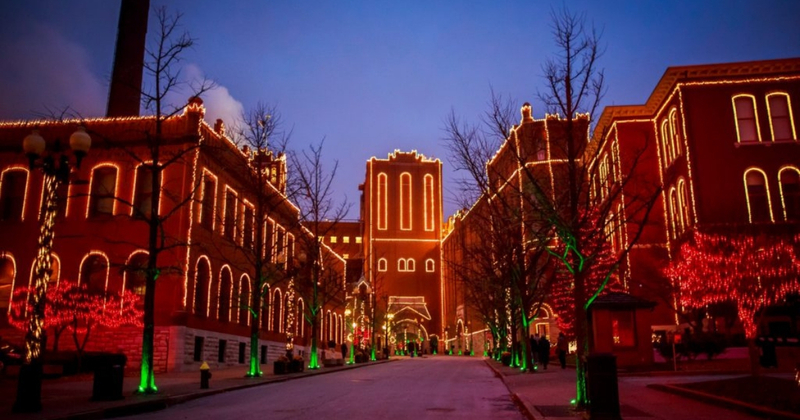 This holiday season, tour the Anheuser-Busch Brewery Lights and Beer Museum in St. Louis! 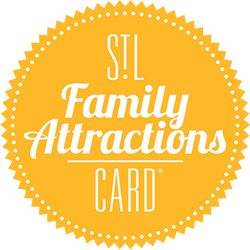 Of all of the things to see and do in St. Louis, touring the Anheuser-Busch Brewery Lights and Beer Museum are at the top of the list! Not only will you be taken back to the mid-1800s through the ground’s Romanesque revival style architecture, but you’ll see the modern day business excellence that a 19-billion-dollar company produces for its worldwide consumers. There are many different tour options depending on what aspect of the Brewery you are interested in! The brewery experience begins at 1200 Lynch Street, where you will be greeted by a guest service specialist. Each team member is well versed on what there is to offer each guest, and gives in-depth information about what each tour experience will include. One of the tour options is the complimentary brewery tour, which is, you guessed it, free to everyone! On this tour, you will hear a brief background history about our company’s founders, Eberhardt Anheuser and Adolphus Busch, check out the historic stables, the Beechwood aging cellars, and the brew house. You will also receive two free samples along the way! Interested in history and architecture? The Beer Museum tour is for you! The Beer Museum tour is a $15 option led by a knowledgeable tour guide who explains the history of the company, talks about the architecture of the complex, as well as visits the Beer Museum in the historic Old Lyon Schoolhouse. This tour will check out the three national historic landmarks on the brewery grounds; the historic stables, the brew house, and finally, the Old Lyon Schoolhouse. Buy one admission to the Beer Museum and get the other FREE at the Anheuser-Busch Brewery! The first stop on the beer museum tour, always a crowd favorite, are the historic stables. Hang out with the world famous Budweiser Clydesdales and check out the stable’s beautiful architecture. 51% of the building, built in 1891, is still original! These stables aren’t like any stables you have ever seen. The Budweiser Clydesdales are living in style! After checking out the Clydesdales, you’ll head down to the historic brew house, built in 1891. Adolphus Busch spared no expense on his brew house: it features beautiful tile work, iron work, and hop-vine chandeliers that will blow you away. Stepping into this brew house immediately transports you back to 1891 when all of the brewing was done by hand. Finally, visit to the Old Lyon Schoolhouse. This building is the oldest building on the campus, and is the third national historic landmark on the tour. Built in 1868, the building served as a public schoolhouse for the city of St. Louis. Today, it serves as the Anheuser-Busch Brewery Beer Museum. With six different galleries, covering everything from company advertising to honoring the brew masters, this museum can answer any questions that you might have. In the schoolhouse, you will receive a sample of Budweiser in a room meant to replicate an 1800’s tavern. You will also get to take home a souvenir sample glass. Finally, once you have checked out the museum, head back up to the tour center to enjoy a complementary full size sample of Budweiser, Bud Light, Shocktop, or Stella Artois Cidre. There is so much to do at the Anheuser-Busch Brewery! If you don’t have any interest in taking a tour, there are many other things you can do at the brewery! The Biergarten is a full service restaurant that is located on the brewery grounds serving your typical bar-food menu. There are also 20+ different beers on tap for you to try! Inside the tour center, there is also a gift shop where you can purchase all of your Budweiser memorabilia. 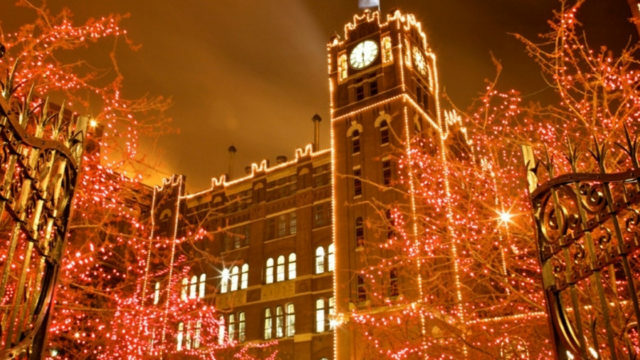 During the holidays, check out the Anheuser-Busch Brewery Lights! With the whole complex filled with twinkling Christmas lights, the historic buildings look more beautiful than ever. Bring the family and check out one of the best light displays in the city for FREE! Beginning on November 15th, the display is open Thursday-Sunday from 5pm-10pm. The display will be open until December 30th. 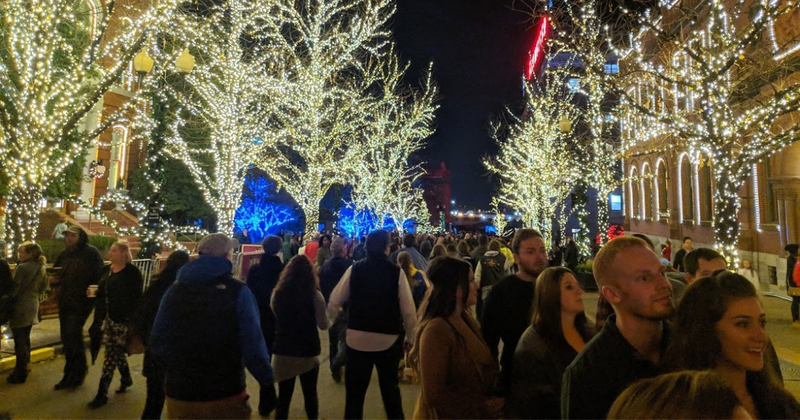 Get into the holiday spirit with free beer, an ice skating rink, food, and beautiful lights! The brewery experiences team also offers a number of paid tour options, as well as a beer school. Click here to reserve ahead of time! Tour hours are Monday-Saturday 10am-5pm, and Sunday 11am-5pm. Biergarten and Gift shop hours are from 11am-8pm, 7 days a week.